Sometimes I Read: Dual Review: "Anne of Green Gables" and "I'd Tell You I Love You, But Then I'd Have to Kill You"
Dual Review: "Anne of Green Gables" and "I'd Tell You I Love You, But Then I'd Have to Kill You"
SYNC, a fantastic summer program which I’ve previously discussed, paired L.M. 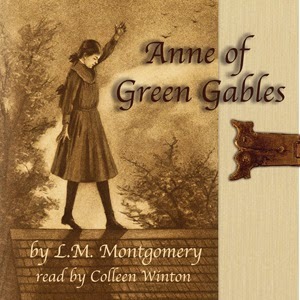 Montgomery’s classic “Anne of Green Gables” with Ally Carter’s contemporary “I’d Tell You I Love You, But Then I’d Have to Kill You” as one of their free audiobook sets this past summer. The SYNC pairs gain an added depth when read/listened to in concert, so I’ve reviewed them together. Unfortunately, this is the first pair from this summer that has been disappointing. To be honest, I knew approximately nothing about “Anne of Green Gables” before I started it. The novel is set in Canada, where orphan Anne is adopted by the Cuthberts, a brother and sister who had actually wanted a boy to help with the farm. The book is a collection of her adventures and misadventures, taking a somewhat rambling approach to her various escapades that are connected by her growing love and admiration for her friends and found family. Meanwhile, “I’d Tell You I Love You, But Then I’d Have to Kill You” takes place at a secret boarding school for teenage girls who are being trained as spies. There are many references to fictional covert operations connected to historical events by the girls’ family members and the school’s alums, plus pop culture references (including at least two Buffy the Vampire Slayer references, so bonus points there). Cammie is the daughter of the school’s headmistress and retells the story of meeting her off-campus, townie boyfriend as if she were debriefing her superiors. The biggest trait these two audiobooks share are precocious main characters narrated in increasingly grating voices. In “I’d Tell You,” the audiobook narrator, Renée Raudman, whines much of the first-person text, and speaks in a lower-pitched, slower-paced voice for the love interest that makes the listener assume that he is a complete idiot, even when he says sensible things. But the worst disservice done by Raudman’s performance is that the high-pitched gaiety interspersed with a playful severity when things turn serious makes light of the character’s thoughts and feelings, as if they are mere trifles spoken by a frivolous girl. This is the opposite of what the character, a spy in training known for her ability to remain unnoticed, is supposed to be. In “Anne,” the audiobook narrator, Colleen Winton, voices Anne so that she always seems on the verge of hysterics – from breathless wonder to hopeless depression, it’s all a bit overacted. Anne’s defining character traits include verbosity and propensity for hyperbole. Every time she speaks she rambles on about anything that comes to mind. This might be effective on a page as a block of text, but it’s a lot to take in aurally even before adding tone and inflection. When Winton trills through these thoughts, it sounds condescending and belittles the character’s legitimate thoughts and beliefs, especially in contrast with the extreme earnestness with which the non-dialogue portions are recited. I may have liked these books had I read them in print without the narrators offering their infuriating takes on the characters. Each book looks at the importance of friendship to a young girl, and how first romance should inspire a young woman to be their best, rather than shrink in comparison to the object of her affection. Anne is a female version of Tom Sawyer, always up to mischief but with her heart in the right place. Her relationships with the Cuthberts who take her in is charming and well-developed, with each relationship illuminating the distinct personalities of each of her caretakers. Cammie is a young Buffy before the weight of saving the world has brought her down, focused on her friends and her mission, if a bit boy-crazy. Both make fine role models for young girls, especially if paired with discussions of their downsides. But the audio of each novel took away from the reading experience. Verdict: Dismissed in audio, Jury’s Out on print. The juvenile plots don’t hold up well for older readers, though either would make a fine read for a middle school student. If you choose to explore them, stay far away from the audio. “Anne of Green Gables” by L.M. Montgomery, in the public domain. Audiobook narration by Colleen Winton, published by Post Hypnotic Press on May 30, 2013. “I’d Tell You I Love You But Then I’d Haveto Kill You” by Ally Carter, published by Disney-Hyperion on May 1, 2006. Audiobook narration by Renée Raudman, published by Brilliance Audio on April 25, 2006.